For other songs with the same title, see Sacrifice (disambiguation) § Songs. 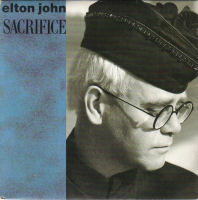 (1989) "Club at the End of the Street"
"Sacrifice" is a ballad performed by musician Elton John. The lyrics are by Bernie Taupin and the music by John. The song appears on the 1989 album Sleeping with the Past. It was first released in October 1989, then in 1990, and was the second single from the album. It achieved success, particularly in France and the UK, where it became his first solo chart-topper, spending five weeks at the top. A country music cover of the song was performed by Don Henley and Vince Gill as part of the 2018 tribute album Restoration: Reimagining the Songs of Elton John and Bernie Taupin. "Sacrifice" is inspired both by the Aretha Franklin song "Do Right Woman, Do Right Man" and described as a Percy Sledge song by Elton John[according to whom?]. The song is beloved by both John and Bernie Taupin and deemed a bookend of sorts to their first hit "Your Song". Taupin has said he is surprised he wrote it, and said in an interview, "I think 'Sacrifice' is one of the best songs we've written." The song is not a typical love song, but rather a song about a breakup of a marriage where the loss of the relationship is "no sacrifice". Although the single was successful, Elton John did not tour Europe in both 1989–1990 to support the Sleeping with the Past album (with the exception of one appearance in Knebworth Park on 30 June 1990) touring only in the US and Australia. The 1989 European tour was, instead, in support of the Reg Strikes Back album, with no material representing Sleeping with the Past. In all shows that were done to support Sleeping with the Past in 1989–1990, Elton played this song solo on his Roland RD-1000 Digital Piano. The video, which follows the song's lyrics, portrays a man and woman having problems in their relationship after being married and raising a daughter. After they go their separate ways, the man raises his daughter alone. The video was directed by Alek Keshishian and it had Yasmeen Ghauri and Chris Isaak in it. The version used in the promo video is slightly sped up compared to the album version. The result is a higher pitched vocal and shorter length time. The video was filmed in Los Angeles in 1989, and was the second video made after Elton rejected a version from Ken Russell. Sacrifice was initially released as a single in 1989, but stalled at number 55 in the UK and at number 18 in the US in March 1990. In mid-1990 English DJ Steve Wright began playing the song on BBC Radio 1, soon followed by many more radio DJs. The song was then re-released as a double A-side single, along with "Healing Hands", and reached number one in the UK in June 1990. Thus, it became John's first solo number-one single in the UK Singles Chart, remaining on the top spot for five weeks. With this re-release, Elton John also got his first number one in France and stayed on the chart for 26 weeks. ^ a b "Elton John - Full Official Chart History". Official Charts Company. Official Charts Company. Retrieved 20 January 2016. ^ a b "Elton John singles, Billboard charts". allmusic. Retrieved 9 September 2008. ^ ""Sacrifice", Australian Singles Chart". australian-charts. Retrieved 13 December 2007. ^ ""Sacrifice", Dutch Mega Top 100" (in Dutch). dutchcharts. Retrieved 11 April 2010. ^ ""Sacrifice", French Singles Chart" (in French). lescharts. Retrieved 13 December 2007. ^ "Irish Single Chart, database". irishcharts. Retrieved 9 September 2008. ^ ""Sacrifice" New Zealand Singles Chart". charts.org.nz. Retrieved 11 April 2010. ^ ""Sacrifice", Norwegian Singles Chart" (in Norwegian). norwegiancharts. Retrieved 13 December 2007. ^ ""Sacrifice", Swiss Singles Chart" (in German). hitparade. Retrieved 13 December 2007. ^ "1990 Australian Singles Chart". ARIA. Retrieved 3 September 2008. ^ "Single top 100 over 1990" (pdf) (in Dutch). Top40. Retrieved 12 April 2010. ^ "French certifications, database" (in French). infodisc. Archived from the original on 30 November 2007. Retrieved 9 September 2008. ^ "UK certifications, database". BPI. Retrieved 9 September 2008. This page was last edited on 4 December 2018, at 23:13 (UTC).